I’m pleased to announce the release of The Pansentient League’s Guide to Spotify – my new eBook available now for Kindle ebook readers and apps! 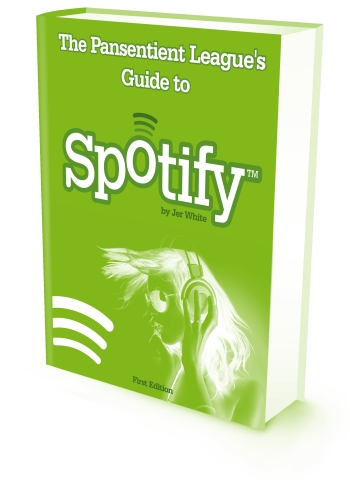 With chapters on how Spotify works, how to find new music, how to stream Spotify on games consoles and getting the best out of Spotify Mobile, The Pansentient League’s Guide to Spotify is ideal for anyone wanting to take their knowledge of Spotify beyond the basics. The Pansentient League’s Guide to Spotify is out now, available as a Kindle ebook from amazon. The content has been completely revised and updated. This blog’s Spotify archives go back over two years, and some of the older posts are now obsolete or very out of date. This ebook gave me the chance to rewrite and update what was still useful and relevant. Related topics are arranged into chapters. Blog posts can come out in a fairly random order: one day you’re reading about some new Spotify feature, the next it’s an album review, followed by a comparison of music services… this ebook groups related topics together to make for a much more consistent read. Read offline. Since you download the entire ebook to your Kindle or Kindle app, you can read the book without the need of a network connection. Great for beach holidays, air travel, when you’re stuck underground for a while, broadband fails etc. The ebook has been professionally edited and formatted. Writing several posts a week can sometimes take its toll, and spelling mistakes and glitches can find there way into the published articles. A professional editor has picked through this ebook with a fine-toothed comb to get rid of any annoying typos and bugs. Exclusive content! While much of this ebook is available in some form or other on this blog, it contains some exclusive content you won’t find anywhere else. Delivery costs. Amazon set a minimum price for ebooks and they also deduct a download delivery cost based on the size of the file. This ebook is the equivalent of 220 hardcopy pages and includes many full-color images, so it’s a little larger than most Kindle downloads. I hope you consider making a small purchase of The Pansentient League’s Guide to Spotify: it’d make me very happy and is a great way to show your support for this blog.